Members of the Catholic church gathered for an opening session during the annual US Conference of Catholic Bishops Monday in Baltimore, Md. BALTIMORE — The bombshell left the country’s Roman Catholic bishops stunned and silent. Gathered for their first meeting since a new eruption of clergy sexual-abuse allegations this summer, the bishops had just finished morning prayers. Then came the surprise Vatican directive: Postpone voting on a plan to hold bishops more accountable for sexual misconduct. The new, tougher standards for bishop accountability would have established a special commission for reviewing complaints against bishops who are suspected of violating the standards. DiNardo said the US bishops did not share the document with the Vatican until late October. DiNardo said he received the directive to hold off on voting late Sunday afternoon, less than a day before the twice-yearly conference was scheduled to convene. The Vatican asked that the American bishops delay their vote until after February, when church leaders plan to discuss the crisis at a global meeting in Rome. 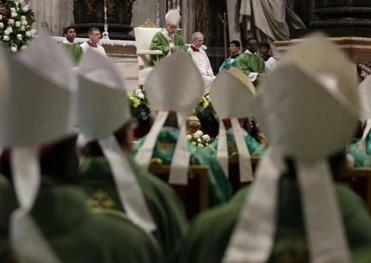 More than 130 US bishops — nearly one-third of those still living — have been accused during their careers of failing to adequately respond to sexual misconduct in their dioceses, according to a Boston Globe and Philadelphia Inquirer examination. 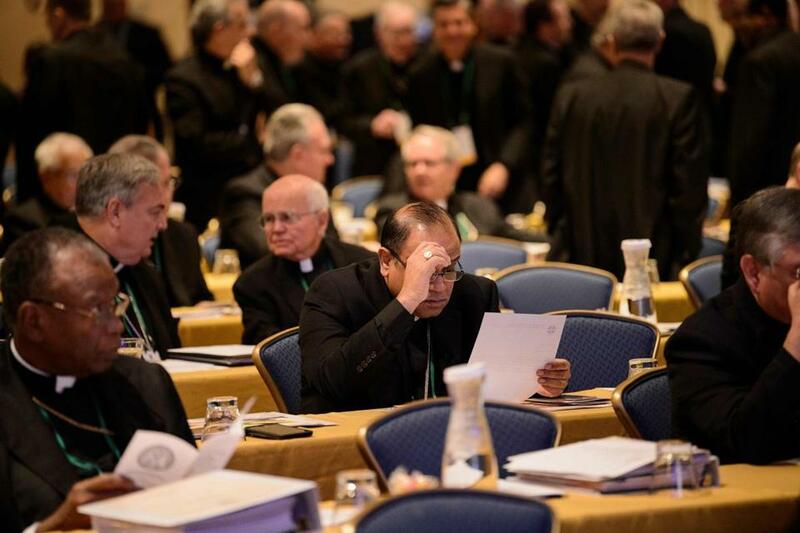 Until the process was halted, more than 200 American bishops were scheduled to vote Tuesday on the new standards. Sixteen years ago, a landmark meeting of the bishops established new standards for priests regarding sexual abuse and misconduct — but the bishops voted to exempt themselves from the restrictions. The proposed changes would close that gap. A recent joint investigation by the Globe and The Philadelphia Inquirer showed that more than 130 living bishops — nearly one-third of those alive — have been accused during their careers of failing to respond adequately to sexual misconduct in their dioceses. Bishops can be removed only by the pope, and very few have seen any consequences for failing to remove problem priests or for being perpetrators of abuse. The details of the new proposals were not immediately available, a spokeswoman for the conference said Monday afternoon. The agenda for the conference also was not provided to reporters until the weekend. DiNardo, when pressed at a news conference about the Vatican’s objections, said that the Congregation of Bishops in Rome had raised questions related to canon law. “It was quizzical to me when I saw it,” DiNardo said. The delay left bishops at a loss for words, caught between an inability to press ahead with reforms long sought by angry parishioners and their obedience to the wishes of Pope Francis. Cardinal Sean P. O’Malley of Boston, the pope’s closest adviser on the sexual-abuse crisis, told the Globe he did not hear about the Vatican’s request until 7:30 a.m. Monday. “It was my wake-up call,” O’Malley said with a small smile about the timing. Another possible reason for the Vatican’s request, he said, is that “in Rome there’s always a fear that the United States tends to run off in its own direction, and they want to make sure that what we do is in concert” with other bishops around the globe. Since the crisis exploded in Boston in 2002, sexual-abuse scandals have spread across the Catholic world, gripping the church in Ireland, Chile, Australia, and India, among many other countries. O’Malley, as the head of the Pontifical Commission for the Protection of Minors, has been working to establish global standards for preventing abuse. Despite the delay in voting on the new accountability rules, O’Malley said, the US bishops remain committed to major reforms. But the unexpected move prompted harsh words from longtime critics of the church’s response to the sexual-abuse crisis, particularly following a summer roiled by the resignation of Cardinal Theodore McCarrick, the former Washington archbishop accused of sexual misconduct, and a Pennsylvania grand jury that alleged abuse of more than 1,000 children by 300 priests over 70 years. “I’m shocked,” said Anne Barrett Doyle, a director of bishopaccountability.org, a national organization based in Massachusetts that tracks sexual misconduct by clergy. Monday’s decision shows that the Vatican is trying to undermine “the modest bit of progress that would have been made this week,” Doyle said outside the Inner Harbor hotel where the conference is being held. Immediately after DiNardo announced the delay, Cardinal Blase J. Cupich of Chicago rose to ask that the bishops press ahead and discuss accountability anyway Tuesday. He suggested that they consider nonbinding resolutions that DiNardo can bring to Rome in February. Bishop Christopher Coyne of Burlington, Vt., a former aide to Boston Cardinal Bernard F. Law, said he immediately saw a public relations problem when he heard of the delay. “I said, ‘That’s not good.’ It’s going to be seen as kind of a postponing of action and not doing what we need to do,” Coyne said. DiNardo pushed back against questions from reporters about whether American bishops should have voted on the recommendations despite the Vatican’s demand. When Rome speaks to its bishops, he said, those bishops must pay attention. “We’re just not a religious NGO; we’re a church,” DiNardo said of American bishops who need to act in concert with Catholics globally. “We’re incredibly respectful of the Holy See” in Rome. Michael Sean Winters, a columnist for National Catholic Reporter, said he believes the Vatican asked for the delay because “the US bishops don’t have the moral authority to deal with this crisis” at present. “This iteration of the crisis has marked a turning point in how American Catholics perceive the church,” Kaveny said. Instead of viewing the crisis as the work of a small group of rogue priests, the latest wave of allegations has persuaded many Catholics that sexual abuse is not an aberration, Kaveny said. “They’re seeing it as something that’s running through the system, something that’s enabled by the system,” she said. The Vatican’s envoy to the United States, Archbishop Christophe Pierre, acknowledged the deep, continuing scope of the crisis and its wounds. “When protection of the young and vulnerable becomes not just a duty but a calling . . . we bishops can rightly take our place as leaders looked up to rather than down upon with scorn,” Pierre told the bishops. Editorial: Bishops meet to resolve sexual abuse crisis, but does self-policing work in the Catholic church?